Gratefully Inspired: must ask mama - a new series! Today I am thrilled to announce a new series - MUST ASK MAMA! My sweet Lynzy had the idea and has graciously decided to host. Details are below! Hi Everyone! My name is Kilee from ONE little MOMMA. I am a wife, momma, and handmade business owner living outside of Kansas City. I love to thrift shop, and I am a die hard DIY'er and can spot an upcoming trend years in advance. I blog about fashion, easy DIY projects and real life as a SAHM. I've been married for 7 years and I have my hands full with three little boys Easton (3), Kesler (2) and Knox (8 months). My husband and I own a business called ONE little BELT where we hand make and sell belts for babies and toddlers and leather jewelry for women. Hi, I'm Veronika! Veronika's Blushing is a personal style, lifestyle, beauty and home decor blog I started in 2009. I'm 30 years old and I live in Houston, Texas. I have a beautiful newborn daughter, Harper Reese, and I've been married to my husband, Kevin, for 4 years. Our first "baby" is our shi tzu-poodle mix, Lulu (he’s a boy). In addition to being a wife and mom, I work full time as a public relations specialist for a not-for-profit organization and I feel blessed to have a job that I love and find very fulfilling. Hi Everyone! :) My name is Lynzy and I am the face behind the lifestyle blog, Sparkling Footsteps. It focuses on personal style, motherhood, exercise and just life in general. I am married to a handsome fellow who happens to be a doctor in the ER (I work in the ER as well as a Physician Assistant). We welcomed our first little nugget named Olivia this past September and we just cannot get enough of her. She has changed our world for the better and we continue to be inspired by her every day. We enjoy traveling, healing others through the world of medicine and being the best parents we can be! Hi! I am Britt, and I am a new mama to Scarlett Isabel who is 9 months old, wife to a medical student, and aspiring photographer. I am a southern soul, romantic, and love to celebrate. On my blog I write about my perspective on life, babies, marriage, style, and all things I am passionate about. Hello! My name is Erica. I'm an attorney, Marine Wife, and former personal trainer. I'm originally from South Padre Island, Texas, but military life has taken me to Hawaii, California, Tanzania, and (soon) Virginia. I love surfing, hiking, music, and art. I have an almost-two-year-old daughter and a baby boy due in April. I blog about parenting, fitness, travel, and life on the move. 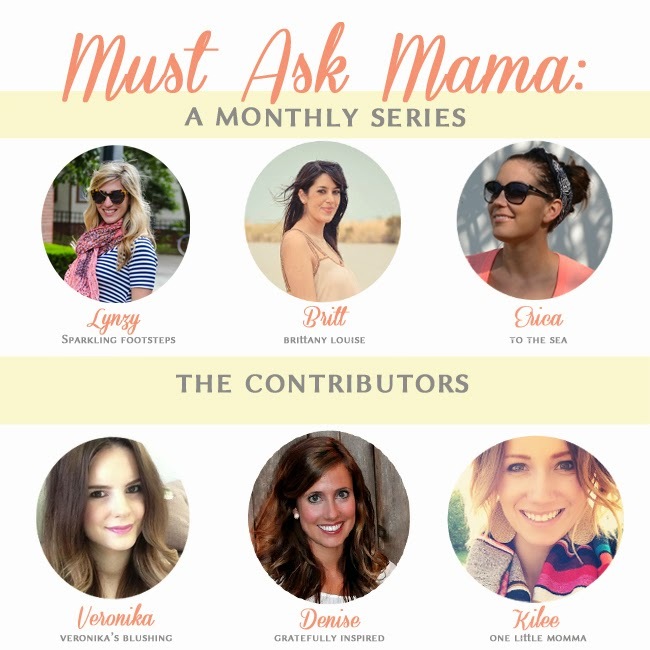 A mama's post series that will feature your questions that you would like all of us to answer. Each month we will feature three questions from our readers (linking back to your blogs as well - or you can choose to be anonymous!) and we will all have an answer (from our point of view) for each question. This way you can get a perspective from six different mamas, because we all know every baby is different! Here on the internets! Lynzy will be posting all of our responses in once place on her blog. But I will have a link to that every month here! You are able to submit your question once the post goes live for that particular month. Send your questions to sparklingfootsteps (at) gmail (dot) com. The first three questions will be answered the following month! Have any questions? Email Lynzy now! This is such a wonderful idea!! Such a good idea! I'm not a mom, but I plan to be in the future and I seriously soak up all the mom/mom-to-be stuff that I can! hey, so fun! go mamas!! !